Thanks for trying the demo button! 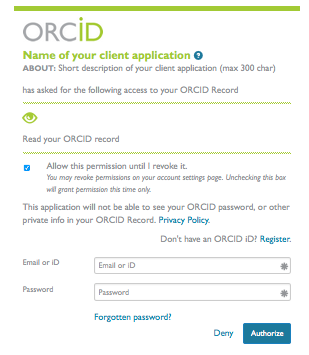 Before you can use ORCID's Member API, need to create an API client which will give you login credentials for your application: a Client ID (consumer KEY) and Client Secret (consumer SECRET). Your application will use these credentials as it interacts with the ORCID API. To obtain client application credentials for the Member API on the production site, you first will need to become an ORCID Member. Notes for ORCID staff: Let us know if you're using a vendor system, need additional redirect URIs, or have any other questions or notes. Contact email address: We will send the credentials to this address and we will use it to contact you about bugs and important API notifications and updates. Name of your client application (Sandbox only): Displayed on authorization screen and list of trusted organizations. Generally the name of your organization. Short description of your client application: Displayed on authorization screen with question mark icon. A short description of your organization or application. URL of the home page of your application: Displayed on list of trusted organizations. A link back to your organization or the main page of your application. OAuth2 redirect URIs or callback URLs for the client: Permitted URL(s) in your web application where users would be returned to after they authorize access to their ORCID record data. Starting January 2017, all redirect URIs must be HTTPS for production (live) server clients. Once you have made your request, a manual process happens to issue you credentials and you will get an email with your client iD and client secret. Typically these requests are process in less than 24 hours. If the client app is configured with no redirect_uris, then any redirect_uri can be used. This is less secure than specifying redirect_uris. The redirect_uris give an extra level of security because they prevent somebody using someone else's stolen client credentials (because we would never redirect to their domain - they would also have to have control over the user's DNS to get round that!). For more on the potential risks here, you may enjoy this short post staring "Evil User": OAuth 2.0 Redirection URI Validation. If they need https as well, then that needs to be registered separately. Also, sub domains need to be registered separately, e.g. http://app.thirdparty.com. NOTE: If you decide that this approach might work for you - you can perhaps handle the URIs by registering all of the redirect URIs in one of your domains and then redirect again to the appropriate domain. This method is encouraged when practical. All redirect URIs must start with the https prefix on the production server, while http is allowed for testing on the sandbox server. Localhost can be registered as a redirect URI using http://localhost (for Sandbox server only).